St. Petersburg, or St. Pete as the locals call it, has a storied history. Actually, St. Pete became it’s formally shortened name in 1994. It’s close to Tampa Bay on the Gulf of Mexico. It also has great beaches to go with the fun history. Williams came to the area from Detroit, Michigan, and purchased the land that now encompasses St. Pete in 1876. Demens was born and raised in St. Petersburg, Russia and brought the railroad to the area in 1888 and it became a boon for the area. It was incorporated as St. Petersburg on February 29, 1892. According to local legend, the city was named St. Petersburg after Demens won a coin flip for naming rights. Since it was his home in Russia, he named the area for the place he grew up. Williams, as the loser, got to name the first hotel, which he also named after his birthplace. The first hotel was called The Detroit Hotel, and today exists as a condominium. Other historic hotels, which are still hotels, are the historic Pier Hotel. This hotel was built in 1921 and was formally called the Hotel Cordova. The other is The Heritage Hotel, built in 1926. F. A. Davis, a publisher from Philadelphia came to the area and started the area’s first electrical service in 1897. Then he moved onto establishing the first trolley service in 1904. Given its proximity to the Gulf of Mexico, it’s only natural that the city’s first major industry, wholesale fish sales, was established in 1899 when Newport, North Carolina native, Henry W. Hibbs, established his wholesale fish business at the end of the railroad pier, which extended into the channel. 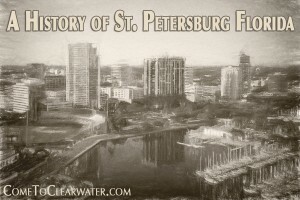 Between 1906 and 1908 the shipping channel was dredged and the deeper channel opened St. Pete up to increased shipping. St. Pete is a great place to visit, for beach lovers and history buffs alike!